In 10-inch nonstick skillet, heat oil over medium heat. Cook onion in oil, stirring occasionally, until tender. Stir in zucchini. Cook 4 to 6 minutes, stirring occasionally, until crisp-tender. Remove from heat. Carefully stir in soup, water, pepper sauce and rice. Heat to boiling; reduce heat to low. Cover and cook 13 to 15 minutes or until rice is tender. Stir in tomato. Sprinkle with cheese. Cover and cook about 2 minutes or until cheese is melted. 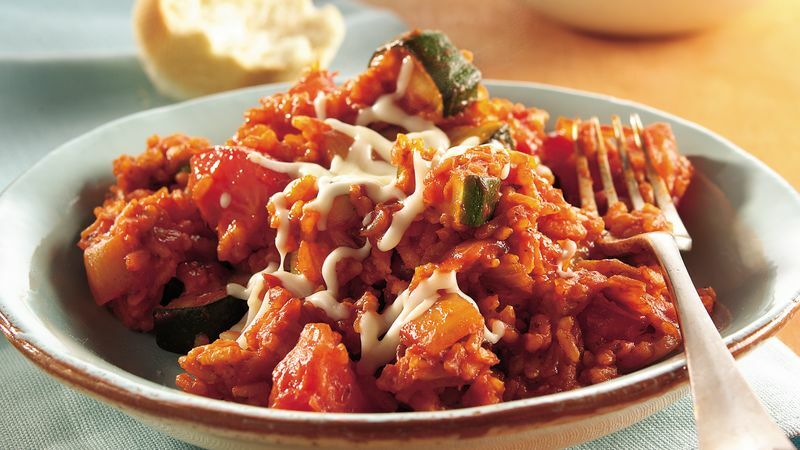 Add a little more spice to this entrée by increasing the red pepper sauce to 1 tablespoon.